One of the most talked about traditional foods is the turkey. And if you watch the media around the month of Thanksgiving, there are lots of people talking about how to cook a turkey correctly to avoid foodborne illness. Your turkey needs to be thoroughly cooked. This means that the inside of your bird needs to reach at least 180 degrees. If it doesn't, the meat may be undercooked, leaving you at risk for salmonella or toxoplasmosis. Many people enjoy baking for the holidays. Families traditionally love to make pumpkin pies, cookies, and cakes. Just be watchful that you don't sample the batter while cooking or contaminate a surface that isn't cleaned with the raw batter. Remember that raw eggs are putting you at risk for salmonella. Try snacking on some sliced fruit or nuts as you bake and wait until your baking is done before sampling. If you absolutely love raw cookie dough batter, there are some products on the market that taste like cookie dough but are not dangerous. There is nothing as yummy as a big tray full of hors-d'oeuvres like fruit and soft cheeses. However, in pregnancy, these cheeses are off limits due to the risk of listeria. So avoid cheeses like Brie, Camembert, goat cheese, Gorgonzola, Havarti, Muenster, and Roquefort. Don't fear, there are some safe cheeses, like Cheddar and Swiss. This year skip the stuffing of the turkey and make your stuffing or dressing outside in a pot or pan. Stuffing that is cooked inside the bird runs the risk of being contaminated by undercooked meat as well as not getting hot enough on the inside to destroy those germs. Traditional family sauces like Hollandaise sauce, creams or ice cream can be made with unpasteurized eggs. This increases the risk of salmonella. Consider using a pasteurized egg product like Egg Beaters instead to add safety to your holiday cooking. If your family is serving up hot or cold cider, skip it if it's homemade or made from unpasteurized products. The risk here is from E. coli. Try hot chocolate or a commercially prepared version this year. These need to be thoroughly washed before you eat them. They can be exposed to toxoplasmosis in the dirt, and if not properly washed, you're also exposed. Take charge of washing them yourself to ensure a good, thorough washing. Looking at some lox or smoked salmon? Unless you know it's from a can, skip it. Those products found in the refrigerated section of the grocery can be contaminated with listeria. The same goes for patè. There is a really good vegetarian pate recipe you could try instead, we find it commercially prepared with beans. Don't be tempted to "celebrate" with alcohol and watch for hidden alcohol in drinks. If you want a fun substitute, consider virgin recipes or sparkling cider. This may take some planning ahead or supply your own fun beverage. Remember to wash your hands before, during and after food preparation to avoid germs and contaminating other foods. Thoroughly clean surfaces and utensils that have come into contact with raw meats. When it's all said and done, be sure to get food into the refrigerator within two hours for maximum safety. Centers for Disease Control and Prevention. 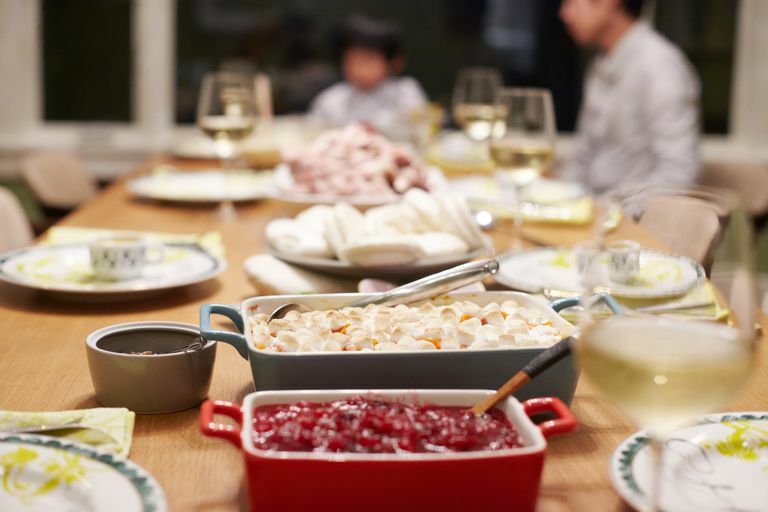 Food Safety Tips for Your Holiday Turkey. November 2015. Centers for Disease Control and Prevention. Foodborne Germs and Illnesses. September 2016.